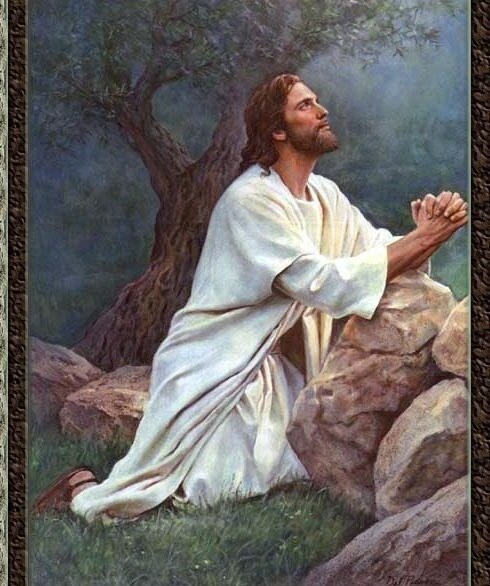 Contents Below: The Prayers of Jesus, How Jesus Prayed, What Jesus Taught About Prayer, and My Prayer Examen: Am I Praying Like Jesus? “He advanced a little and fell prostrate in prayer, saying, My Father, if it is possible, let this cup pass from me; yet, not as I will, but as you ill…Withdrawing a second time, he prayed again, My Father, if it is not possible that this cup pass without my drinking it, your will be done!... He left them and withdrew again and prayed a third time, saying the same thing again. "When you pray, say: Father, hallowed be your name, your kingdom come. Give us each day our daily bread and forgive us our sins for we ourselves forgive everyone in debt to us, and do not subject us to the final test." After withdrawing about a stone’s throw from them and kneeling, he prayed, saying, “Father, if you are willing, take this cup away from me; still, not my will but yours be done.” And to strengthen him an angel from heaven appeared to him. He was in such agony and he prayed so fervently that his sweat became like drops of blood falling on the ground. When he rose from prayer and returned to his disciples, he found them sleeping from grief. And Jesus raised his eyes and said, "Father, I thank you for hearing me. I know that you always hear me; but because of the crowd here I have said this, that they may believe that you sent me." "I am troubled now. Yet what should I say? 'Father, save me from this hour'? But it was for this purpose that I came to this hour. Father, glorify your name." When Jesus had said this, he raised his eyes to heaven and said, "Father, the hour has come. Give glory to your son, so that your son may glorify you, just as you gave him authority over all people, so that he may give eternal life to all you gave him. Now this is eternal life, that they should know you, the only true God, and the one whom you sent, Jesus Christ. I glorified you on earth by accomplishing the work that you gave me to do. Now glorify me, Father, with you, with the glory that I had with you before the world began. "I revealed your name to those whom you gave me out of the world. They belonged to you, and you gave them to me, and they have kept your word. Now they know that everything you gave me is from you, because the words you gave to me I have given to them, and they accepted them and truly understood that I came from you, and they have believed that you sent me. I pray for them. I do not pray for the world but for the ones you have given me, because they are yours, and everything of mine is yours and everything of yours is mine, and I have been glorified in them. And now I will no longer be in the world, but they are in the world, while I am coming to you. Holy Father, keep them in your name that you have given me, so that they may be one just as we are. When I was with them I protected them in your name that you gave me, and I guarded them, and none of them was lost except the son of destruction, in order that the scripture might be fulfilled. But now I am coming to you. I speak this in the world so that they may share my joy completely. I gave them your word, and the world hated them, because they do not belong to the world any more than I belong to the world. I do not ask that you take them out of the world but that you keep them from the evil one. They do not belong to the world any more than I belong to the world. Consecrate them in the truth. Your word is truth. As you sent me into the world, so I sent them into the world. And I consecrate myself for them, so that they also may be consecrated in truth. "I pray not only for them, but also for those who will believe in me through their word, so that they may all be one, as you, Father, are in me and I in you, that they also may be in us, that the world may believe that you sent me. And I have given them the glory you gave me, so that they may be one, as we are one, I in them and you in me, that they may be brought to perfection as one, that the world may know that you sent me, and that you loved them even as you loved me. Father, they are your gift to me. I wish that where I am they also may be with me, that they may see my glory that you gave me, because you loved me before the foundation of the world. Righteous Father, the world also does not know you, but I know you, and they know that you sent me. I made known to them your name and I will make it known, that the love with which you loved me may be in them and I in them." Then children were brought to him that he might lay his hands on them and pray. When you pray, do not be like the hypocrites, who love to stand and pray in the synagogues and on street corners so that others may see them. Amen, I say to you, they have received their reward. But when you pray, go to your inner room, close the door, and pray to your Father in secret. And your Father who sees in secret will repay you. In praying, do not babble like the pagans, who think that they will be heard because of their many words. Do not be like them. Your Father knows what you need before you ask him. “This is how you are to pray, Our Father in heaven, hallowed be your name, your kingdom come, your will be done, on earth as in heaven. Give us today our daily bread; and forgive us our debts, as we forgive our debtors; and do not subject us to the final test, but deliver us from the evil one. Pray that your flight not be in winter or on the sabbath, for at that time there will be great tribulation, such as has not been since the beginning of the world until now, nor ever will be. Pray that this does not happen in winter. For those times will have tribulation such as has not been since the beginning of God’s creation until now, nor ever will be. My Prayer Examen: Am I Praying Like Jesus?